This is an incredibly scenic hike with great views of both Lago Vogorno and Lago Maggiore. You start out in Vogorno, then climb endless flights of steep stairs up to Rienza. After passing through an attractive forest you get to Alpe Locia and continue the steep climb up to Pianca and Btta di Rognoi. 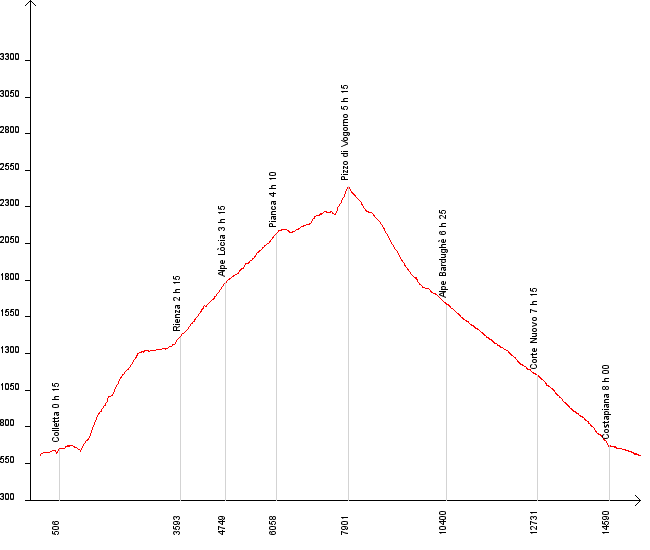 The last part of the ascent to Pizzo di Vogorno is also very steep but getting all the way up rewards the effort. If you get lucky with the weather, you can enjoy a breathtaking 360 degree view from Pizzo di Vogorno. We mostly saw the clouds, unfortunately but on the way down towards Alpe Bardughe we left the clouds above and could enjoy an amazing view of both Lago Vogorno and Lago Maggiore with the Brissago islands and far beyond. The direct surroundings of the top part of this hike are also very attractive with the path following the ridge and the views of very wild valleys below. On the way down you cross beautiful Alpe Bardughe (with the Capanna Bardughee mountain hut) and then follow on to Corte Nuovo and down to Vogorno. Most of the way down you can enjoy the pretty lake Vogorno which doesn't seem at all to be getting closer. The hike is one of the most beautiful in Valle Verzasca but is also very hard on the muscles and the knees with 1950m of altitude difference between Pizzo di Vogorno and Vogorno.